Loss of deposit if no flexi-booking is purchased. Contact hostel 24hrs before your booking if you need to make any changes in numbers or days so as to not be charged for full booking. Please contact hostel directly with arrival time. All members of group will be required to leave a security/key/damage deposit (10,000 HUF per person)and to sign a declaration form upon arrival. Full payment is due one week in advance to the arrival date for all groups of 7 guests to 19 guests, & due one month in advance for all groups over 20 guests. This can be paid via PayPal or TransferWise. We do not accept Stag groups or all male groups, if you are either and interested in staying within Budapest Party Hostels then we recommend checking out our sister hostels Grandio Party Hostel or Retox Party Hostel. Unfortunately, due to past experiences, groups must now book the whole room to avoid disturbing other guests. Groups of 5 guests for more must leave a 10,000 HUF security/key deposit, which will be returned on check out providing all keys are returned & no fines need to be applied. For groups over 20 guests security must be additionally paid for, at the rate of 20,000 per night. Vitae hostel awarded the most popular hostel in Budapest 2019 with the Hoscars. This sociable, party-oriented hostel offers a welcoming atmosphere with staff who are'super helpful and friendly and are on hand to include you in the activities, according to users of Hostelworld. They host various different nightly events and dinners and one traveller told us that guests looking for a quiet night can 'hang back at the hostel and play PlayStation, use the Wi-Fi or relax on the balcony'. Vitae Hostel (Seize the night life!) offers the perfect balance between providing a wide range of amenities and facilities of a large hostel, but making you feel relaxed in a sociable, fun and family-esque atmosphere. Whether you are traveling alone, or part of a group, you'll immediately feel welcomed and want to stay with us longer to see what the Budapest hype is all about! Though still participating in a different party every night of the week, Vitae represents the more relaxed, less intense atmosphere of the five hostels under the world-famous ‘Budapest Party Hostels’ group. Clean, spacious, non-smoking and secure dorm rooms are always ready for travelers in need of rest; drunk and sober alike. Our staff, which are comprised entirely of experienced travelers, have all of the best recommendations and tips to make your stay in the beautiful city of Budapest the unforgettable highlight of your travels. And why travel, if not to make new friends along the way? Over 60% of Vitae’s floor space are dedicated common areas for you to meet & mingle with other guests over a game of cards, drinks, or the cheap family-dinners the staff put on for only the cost of the meal’s ingredients. Vitae’s 3 modern kitchens are always accessible and if you’d rather eat your meals over a good film or video game session, there’s a projector room and a snug to lounge in during all hours of the day. We have entertainment central with a darts board, table football, guitar hero, Playstation 4 and netfilx with a projector screen and even chess to stop you from getting bored. Sight seeing and partying don’t always have to go hand in hand, but Vitae’s all staff always try and present a healthy blend of the two together every day with their knowledge of all things Budapest, historic and contemporary. Whether you’re after a romantic evening dinner cruise on the Danube river or a 6am trip to a 24hr bar in the city after a night out, the staff have been in your shoes and will happily point you in the right direction. It won’t take long to notice the ATM, currency exchange, tram stop, bus stop, convenience store, tobacco shop, and 24hr eateries and the cheapest bars are all on the same city block as Vitae. A week with us will include party boats, ruin bar crawls, spa parties, open mic nights, backpacker parties and much more. Of course we are flexible and open to suggestions, so you let us know what you like and we'll see if we can get the group along - and we also know all sorts of cool stuff to do during the day! Hands-down the best hostel!!! There’s always activities scheduled and amazing people to get to know. Especially the staff 😍 Doggo is by far the best host and pub crawl leader I’ve ever had. She took care of everyone there and watched my comedy show to become my number one fan. I would go back just to hang with her! Pablo is just the nicest and funniest guy you will meet there! Ask him to tell you his LA story and about New Jersey so you can cry laughing. Thanks so much!!!!! I loved my stay here - it was clean and the activities planned by this hostel were wonderful. Got to interact alot with people and had a good time. One of the best hostels I've been too. Really good staff, a lot activities, parties organized every day. You can relax and rest if you feel like to anyway. Only thinh to point out was that I got a jacked stolen, it wasn't staff fault just any stupid guest I could say the perfect place to stay if you want to have fun and get to know the city. I will be back for sure! This place is perfect if you love to party but want a place that's quiet after 10pm. They party hard every night and always play a drinking social game before heading out. They head out away from the hostel. The bathrooms are cleaned a few times a day and there were more than enough bathrooms. The building is secure as you need electronic wristbands to be able to enter the premises and there's no curfew. Also a big shout out to Toto for giving me amazing advice on where to visit! I loved staying at Vitae Hostel!! My friend and I booked it very last minute and I’m so glad we did. Everyone staying there was super nice and the staff was very informative. A big thanks to Doggo for giving us all the information we’d need while in Budapest and for letting us know about the cool events the hostel holds. I wish I had more time here! Really friendly and helpful staff . The location of the hostel is amazing as it is right in the center. There’s drinking games every evening , this really helps you meet your fellow hostelers and make new acquaintances. 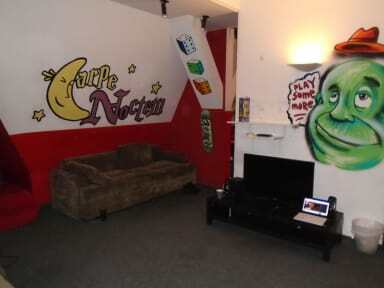 This hostel is cheap if you are looking for best prices and party to meet new people because their have lot of activities the area is good near tram easy to get around city But the hostel is seem bit scary and old more than I though and little bit surprised in common area on the floor that I stayed. Their have 1 bathroom for female and 1 for men on the floor. If you wanna using you have hurry up somehow. 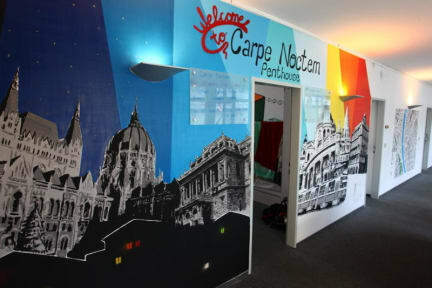 I'd say that Carpe Noctem Vitae is definitely for travellers who like to go out at night but who also enjoy seeing the city and being a tourist during the day. It's a sociable place and we've got a whole range of night-time programs, inclyding free pub crawls, backpackers' parties and party boats. I really think people like us for our community and the welcoming nature of the hostel. Every night the staff at the hostel cook dinner for their guests and get everyone involved before heading out at night.